Today I had the pleasure of going into David’s grade 1 class at school to do a fun little activity. 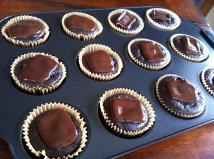 Last week I mentioned to his lovely teacher, Mme Ramona that I would love to bring in some healthy cupcakes for them as a celebration for the end of the school year. She was very gracious and allowed my sister and I, who both have kids in this class, to come in today. I then decided to add a little activity with some health lessons for them to take home and put into practice. We made them do a veggie man. The class has 26 students so the teacher divided them up into 3 groups. My sister and I chopped up 3 bins of veggies with all the body parts ready for the activity. Each group was then given the task to put together their man. The activity included them eating it afterward. My husband Jason had made some hummus for their heads which we had also given to each group. 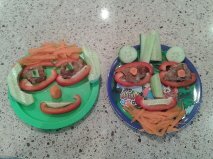 The kids enthusiastically made their man and before we could even take a picture, they were devouring their veggies. Prior to the activity I asked them a couple simple questions to spark their brains about the importance of eating raw veggies. When children are asked what rabbits eat, they are always quick to say carrots and greens. I then ask them what would happen to the rabbit if we fed it ice cream. They immediately let me know the rabbit would get sick. I then asked about a dog and what would happen if it was fed chips and pop. Once again they always reply without hesitation that the dog would get sick. I then bring it back to humans and what happens to us when we eat this type of junk food. They get it. 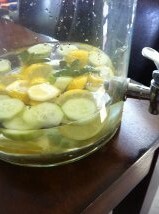 So, I then tell them we wanted to make them healthy and strong today and that is what kids want. Helping them focus on what they want (healthy and strong) vs unhealthy (weak and frail) helps them make better decisions. 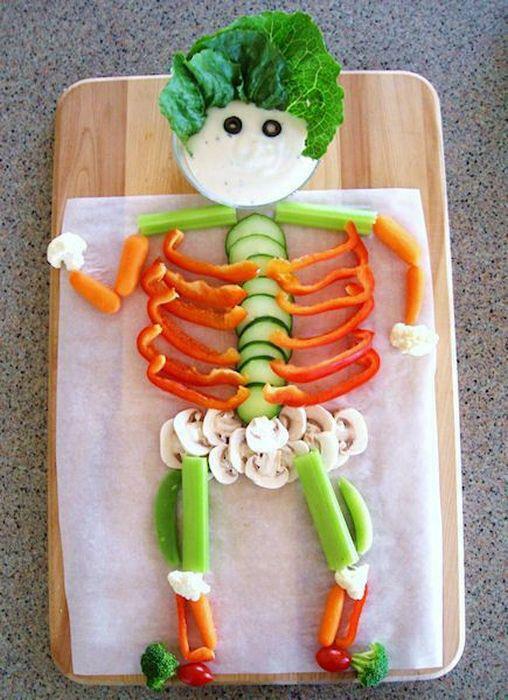 So, this summer have fun adding some raw veggies before every meal. 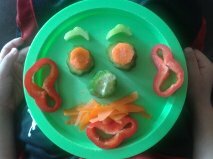 My friend Lois sometimes gets quite creative with my kids and makes them some fun veggie plates. They always love it, especially since she is far more creative than their boring mom:). 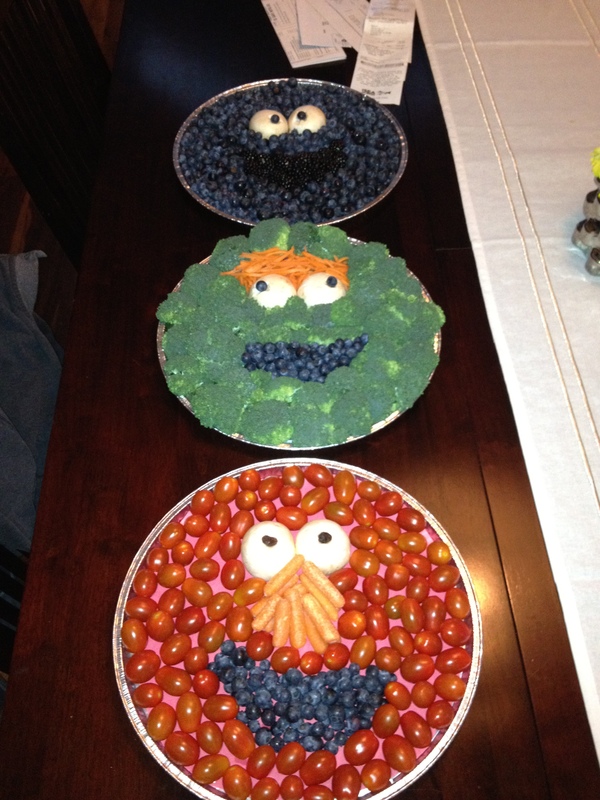 I’ve included the veggie man, a few of Lois’ creations for the boys, and my friend Susanne’s birthday party platters. I hope this sparks some ideas for you and your family to include more healthy raw fruits and veggies into your wellness regime this summer! Thanks so much Melanie, it was so much fun to do with that sweet class!